While the automotive industry still sees the majority of its jobs filled by men, women are stepping up in force and following their hearts to careers that truly mean more than just any old job. It’s about passion, love, and enthusiasm for these leading ladies and this month we checked in with one of the industry’s finest- Holley Performance Products‘ Marketing and PR Coordinator Ms. Liz Miles. Unlike some automotive industry professionals, Liz Miles can’t pinpoint an exact time or reason she got into the hot rod scene. “It just happened,” Miles told us in a recent interview. “I have been asked this question hundreds of times and don’t have a good answer.” But what she does know is that her 1968 Camaro had a lot to do with where she’s ended up. 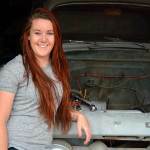 Having searched for a good daily driver prior to her 16th birthday, Miles ran across the first-generation Camaro body style and was instantly hooked. She told us that when she found the ’68 that she still owns to this day, that she bought it because it felt right and learned a ton about cars and the industry as time went on. From there, her passion for American muscle cars just snowballed. That was 12 years ago. For her first job, Miles worked at a local speed shop, which helped her to start learning the ins and outs of the car world. First it was just maintenance, but eventually Miles started modifying and even racing her Camaro. With a solidified passion for the automotive world, Miles went straight to Wyotech in Laramie, Wyoming for her college education. She knew that this would be the smartest move if she were ever going to get in with the kind of shop she wanted. Her hard work paid off as she took home a number of leadership awards and graduated with an Associates Degree, going on to work for Dominator Street Rods, now in Tracy, California, right out of school. Throughout it all, Miles’ Camaro came with her. Over the last 12 years, Miles has seen a lot of success in the automotive world, from her first job at a speed shop to writing for popular automotive magazines like Popular Hot Rodding, and most recently working as a marketing and PR coordinator for Holley Performance Products. Having had experience at PHR and a true passion for cars, Miles was initially approached by Holley to join their sales team, but when the company needed help in marketing, that’s the job Miles stepped into. She hasn’t looked back since. For her day-to-day job, Miles works with media outlets on their Holley-equipped project cars and tech stories. Having experience with magazines like PHR made Miles the perfect media liaison for Holley. Miles also works with Holley’s social media platform, as well as communications with the company’s end users when it comes to general and technical support. All these responsibilities mean Miles gets to travel to trade shows, car shows, and conventions to support the Holley brand and the company’s client base. As far as being a female working for Holley, Miles told us she knows no different and has always felt right at home at Holley. She went on to explain that the group of people she works with, which includes a number of other females in the office, are very supportive and all passionate about the automotive industry and Holley brand. While working for Holley Performance Products is Miles’ main gig, she still writes and photographs for publications like Chevy High Performance and Modified Mustangs and Fords on a freelance basis. This is mainly a weekend thing that she maintains only improves upon her work for Holley and in the industry rather than potentially getting in the way. “All I can say is that when I’m writing a story about a car and I see a Holley product on it, I have an extra big smile on my face,” Miles explained. Though Miles has truly seen amazing things in her automotive career, telling us she’s accomplished a little bit of everything she’s wanted so far, she still has one thing on her automotive bucket list to complete and that’s building a couple more cars. Among the prospects are a Fox Body Mustang with an LS swap and a Datsun 510. She also told us that a C6 Z06 would make a nice addition to her current car collection. When she’s not working on anything car related, Miles enjoys working on her house and in her garden. She’s also recently started learning about the Polynesian culture, including traditional dance, which gives her something to pursue in her free time. As far as where Miles sees herself in five to 10 years, she doesn’t really know but loves it that way. Chances are, she’ll still be doing what she loves–racing and modifying her own cars, working in the industry with top companies and magazines, and supporting brands that she backs wholeheartedly. But, no matter what she ends up doing, Miles will always be encouraging of women in the automotive industry. We’ll leave you with her advice to women looking to branch into the automotive world themselves. “Act confident even if you aren’t yet,” Miles told us. “Sadly being timid usually comes across as weakness and you will have to prove yourself extra hard. Women aren’t that uncommon any more so seek out a female role model if you can!” Great advice from a very successful female in the automotive industry!